Happiest Holiday Wishes from WarcraftPets! Best holiday wishes from all of us at WarcraftPets! 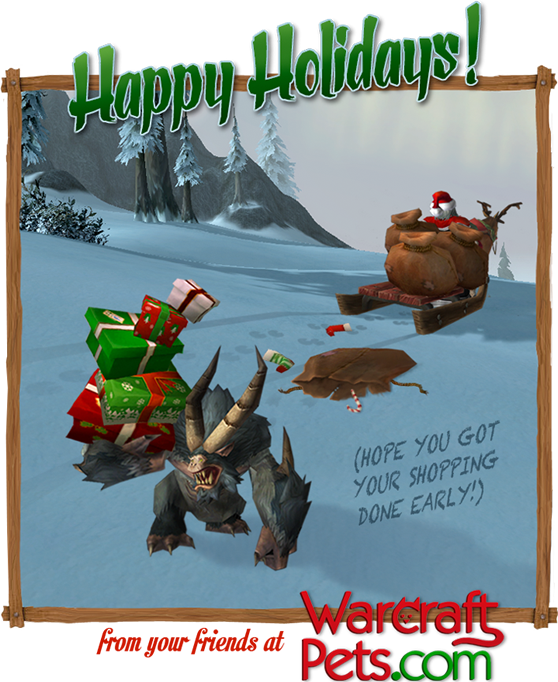 Have a wonderful and safe holiday and a fun-filled Feast of Winter Veil! The first four pets can drop from the [Gaily Wrapped Present] found under the Winter Veil trees in Orgrimmar and Ironforge beginning on December 25th. The next four can be obtained through the "Your a Mean One" daily quest. Last but not least, the Grumpling is a new pet that drops from lootable Snow Mounds in the Winter Veil daily quest area in Frostfire Ridge. Be sure to loot the presents underneath the Winter Veil trees, not just for the pets but also for your very own Red Wooden Sled. Sit your battle pet on top of it and pull them around on a fun sled ride! Thank you for continuing to support WarcraftPets over the years. It has been an honor to serve the pet-collecting community throughout 2015, and we look forward to bringing you the latest on pet battles and new pets in the new year. We wish everyone a prosperous and pet-filled 2016! About the Artist: Michelle Spalding (Drrum) is a talented graphic artist and the creator of the most impressive gallery of pets and mounts you'll find. Check it out! After buying one at the auction house for 300 gold, I found 3 in those little snow piles. So I upgraded them all to rare, sold one for 1200 gold and gave one to a friend. But there pretty good pets! Theyve got the power of Kun-Lai runt with similiar moves to rotten little helper. Happy holidays to everyone, and may all your pet wishes come true. Very happy here to FINALLY have allthe Winter Veil pets! Regarding Michelle Spalding, wonderful artist! Her page of pet photos with matching costumes are OMG!!!! Definitely worth a visit. Very talented artist. Happy Holidays everyone, and a pet-tastic New year! have a great one my fellow collectors, my your pressies be epic! !